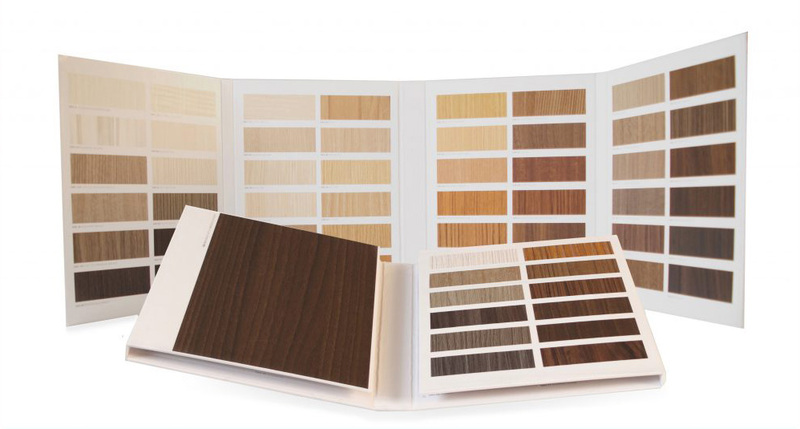 Wood Sample Books are also often called Architectural Folders, Presentation Folders, and Shelf Folders. Sample Books and Architectural Folders are an additional common method of presenting material samples. Designers and consumers prefer to use these folders to get a quick, convenient overview of what’s available in your materials catalog. These books and folders offer a 1 piece shelf presence for your special collections of materials. Sample Books and Architectural Folders can be designed to show anything from a tailored grouping of select product offerings, all the way to your entire product offering. Broad Material Sampling Capabilities – Solid Woods, Veneers, Laminates, Leathers, and even Stone — we can sample it all. Highest Quality in the Industry – Consistent, polished appearance to make your materials stand out from the competition. Best-In-Class Operations – Including project management, design, printing, die cutting, finishing, and quality assurance. Leed manages the entire swatch card production process in-house, using our automated systems for the highest precision positioning in the industry. Leed’s fulfillment services are located in the same streamlined facility, allowing for on-demand distribution with zero unnecessary transit costs. We offer a complete solution for all of your Sample Book needs. To learn more about how Leed can make your products stand out from the crowd, please contact us.